It does not feed fungal and bacterial infections in your body (and doctors estimate that 8 in 10 Americans have fungal infections, like candia!)1. 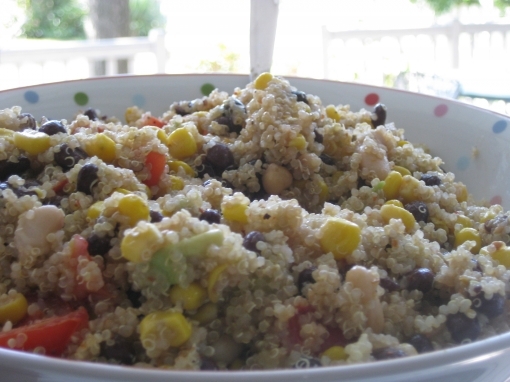 Thanks, http://www.bodyecology.com/07/04/12/quinoa_benefits_guide.php, for the great info! I then explained that it can be eaten in a HUGE variety of ways. I offered a simple veggie mix of either, Italian, Asian, or Southwest/Mexican. Easy to transport, simple to make, cheap and WONDERFUL! Mix all ingredients (except quinoa) together. Add more cumin, lime, dressing and salt and pepper as you like. When ingredients are mixed, add quinoa. Tonight was a perfect summer evening! One of my girlfriends from college and I went to a Total Conditioning class at the gym and then she came over for dinner! Brady was in NYC for work so I decided it was a good time to try some new “girlfriend food” recipes. It was difficult to eat because we were busy chatting and catching up! 2 ears corn, in their husks – roasted corn from Trader Joes frozen section…so good, cheap and easy! Place the artichoke hearts, oil, thyme, garlic, and a small pinch of salt in a blender and pulse until smooth. Add more salt to taste. Set aside. Preheat the grill (stove) to medium heat. Meanwhile, place tomatoes in a bowl and drizzle with oil. Add garlic (if using), basil, and parsley and toss gently to combine. Set aside. When grill is hot, cook the corn, turning frequently, about 10 minutes, or until husks are charred and pulling away from cobs. Let stand until cool, then strip husks and remove silk by rubbing with a dish towel. 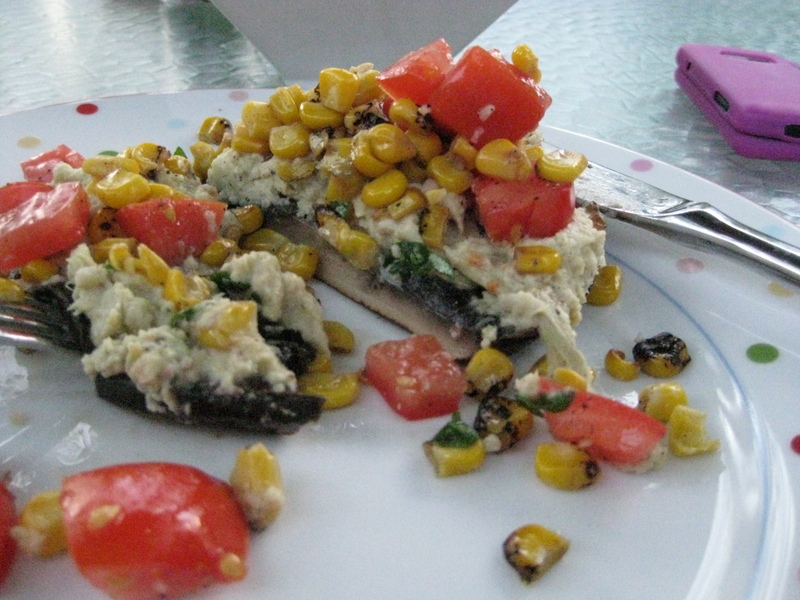 Cut kernels off cob and toss them with tomato mixture; sprinkle with salt and pepper. While the corn is cooling, grill the mushrooms. Pour oil into a small dish. Using a pastry brush, lightly coat both sides of each mushroom with oil. Place mushrooms on grill, gill side down, for about 8 minutes. Flip mushrooms and continue grilling for 6-8 minutes more, or until edges begin to brown. Lightly sprinkle with salt, if desired. On a large serving platter, place mushrooms gill side up and spread artichoke puree over them. 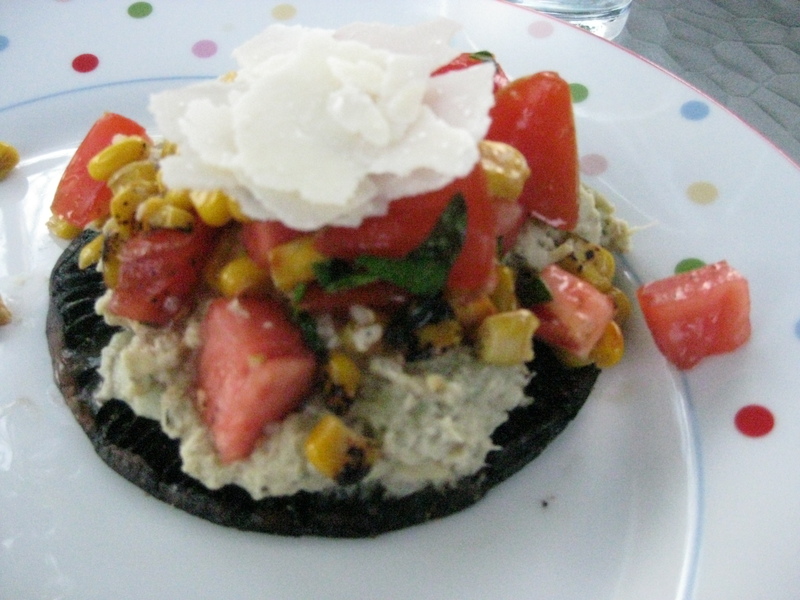 Top with corn-tomato topping and serve. Make the pudding according the package. Put the pudding in an individual bowl, or **a hollow lemon would be cute for a party**, add a spoonful of Fage, a spoonful of Coolwhip and a few drops of lemon juice. Toss on some berries and cereal for extra flavor! 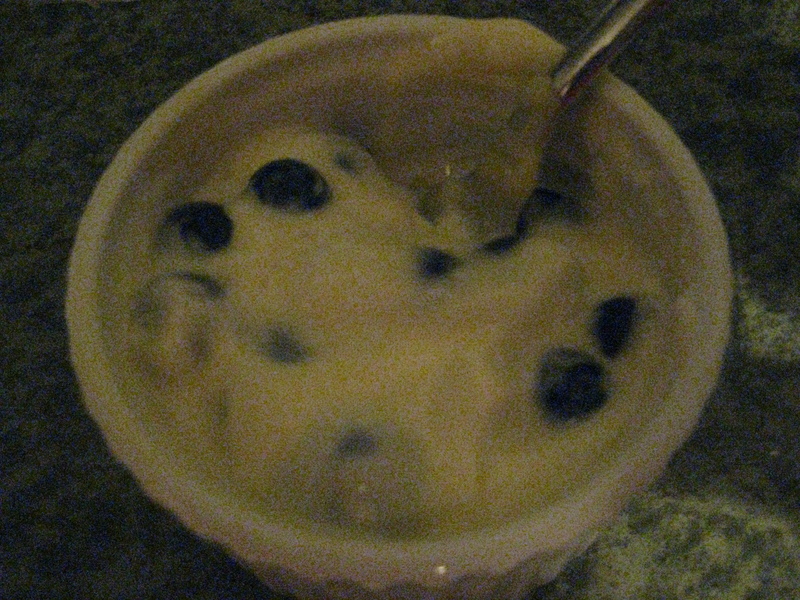 We both loved this summery, creamy, sweet, low-cal dessert! The picture is not to pretty…but it tasted great! Worse pic than I thought – sorry! Overall it was a great night with wonderful food and even better company!